Dolamore, Jaclyn. Between the Sea and Sky. New York: Bloomsbury, 2011. It was not every day that a mermaid became a siren, and not every day that Esmerine attended such a party. It seemed just yesterday that she had moped at home while her older sister, Dosinia, had spent the week in a whirlwind of ceremony and celebration for her siren’s debut. Now Esmerine’s turn had come. When it comes to renewing one of the Classics with a genre twist, Dolamore is masterful. Magic Under Glass was Jane Eyre in a steampunk world. 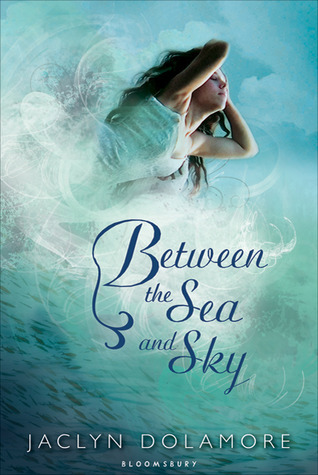 And now we have Between the Sea and Sky, which retells the story of The Little Mermaid mashed with Pride and Prejudice in afantasy setting. While the book didn’t hit the emotional depth of either original (or some of the other mermaid stories, like Donna Jo Napoli’s Sirena), it does have a great world with amusing characters to share. The storyline loosely follows the Pride and Prejudice plot, within a world of such beauty and intensity that I’d love to vacation there. All the side characters the protagonist runs into along her journey are unique and memorable, with special focus on the differing worlds and cultures in the book. I loved the unique element of the sky people with wings, and how the world has to interact with them as well as the mermaids. Rumors spread and prejudices happen. The romance is so sweet and earnest that I was just begging for Esmerine and Alander to get together by the end of the book. Suggested Reader Age:Perfect for middle-grade or YA readers, with no older themes to cause concern for younger readers. This book looks awesome – thanks for the suggestion! That sonds like an good mashup – pride and prejudice + the little mermaid. i love both of those stories!!!! thx. hopefully my library has it. I really liked Magic Under Glass, so I’ll have to go buy this one. I’m not so excited about mermaid stories anymore, but this one sounds intriguing. What are the sky people like? And is there a ‘Jane’ character? Britters: Honestly, I think this book is good enough to buy. I know I’ll be reading it again. Writer Jessie: Mermaid stories aren’t my favorite, but I’ve seriously found a few I just adore. They stand out of the crowd, and just have such an interesting world and fabulous, in-depth characters that I can’t help but love it. And to answer your question, there is and older sister who is kind of more like Lydia than Jane. And the Sky people are amazing. Wings and flying, and just so unique! As much as I liked this book, I absolutely adored MAGIC UNDER GLASS. Not only does it have an amazing cover, but it’s just so creative and a brilliant read! I saw this in the bookstore and seriously contemplated buying it. (No book budget currently, though.) Thanks for the review, it piques my interest even more! Was I the only one who saw the cover and thought, “What is this cover trying to portray?”. I mean, really. Apparently it’s all “romantical” between the sky and the sea ;-). That aside, it does sound intriguing!